I am pleased and honored to be included in the prestigious For Pastels Only, (FPO) Show on Cape Cod, sponsored by the Pastel Painters Society of Cape Cod. The show will run from June 20th-July 12th at the Cultural Center of Cape Cod, 307 Old Main Street, South Yarmouth, MA. The opening is Saturday, June 20th from 6-8:30pm. If you are on the cape this summer, you should stop by. It’s a wonderful show featuring work from 100 panelists. I am also excited about the particular painting that was chosen from the 3 I submitted to the show. “After the Rain” is a bit of a departure for me, as it is painted in pastels over an oil underpainting. I was inspired to try this after watching Michele Poirier Mozzone’s demonstration at the closing of FPO last year. Much of the oil underpainting is showing through, and I loved the way the loose strokes worked with the layered pigment. 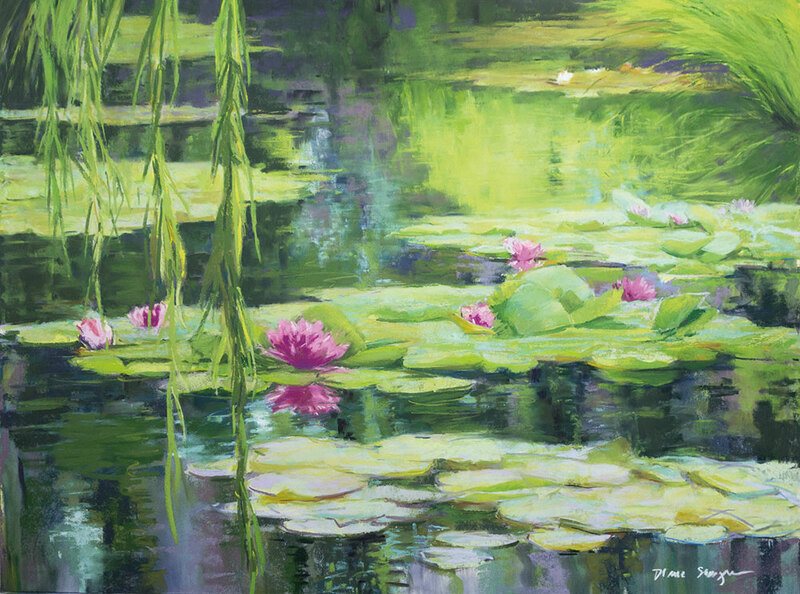 When I saw her demo, I had just returned from France, where I visited Monet’s water garden in Giverney. The resulting painting is on the cover of my site. Last weekend I had the pleasure to take a workshop with Michele, and I can’t wait to do more painting using this technique. Diane, your work is lovely. The colors and composition are inspirational. Congrats on getting into the show! I also live on the Cape in the summers and am just discovering the wonderful Yarmouth Cultural Center. I will take a watercolor class there with Christopher Zang in June. I will make a point of stopping by your show! Diane these are magnificent! I can’t wait to see you AND YOUR work in person! Thanks so much Juan! I appreciate your comment!